I’ve been doing some tests to create a monster made of particles for a short film. 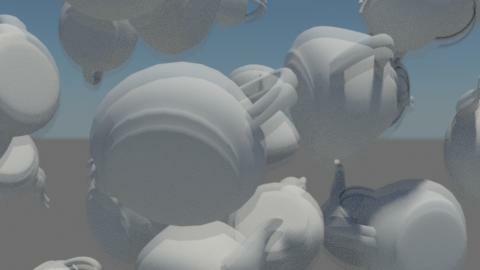 I’ve been very impressed be the speed of rendering Motion Blur in iRay. It’s smooth and high quality with very little performance overhead. The examples below show the effect of increasing Iterations per Motion step on quality and render times. With no motion blur the image renders in 12 seconds. With a slight increase in render time to 15 seconds the motion blur is super smooth. pFlow iRay Render of 200 iterations taking 24 seconds. 2 mBlur iterations per step. pFlow iRay Render of 200 iterations taking 15 seconds. 8 mBlur iterations per step. 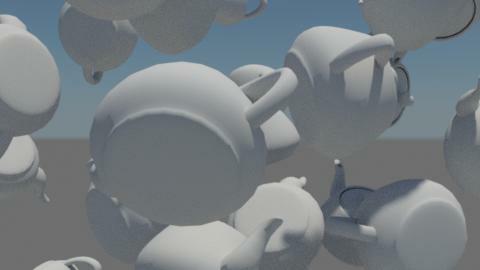 pFlow iRay Render of 200 iterations taking 14 seconds. 16 mBlur iterations per step. pFlow iRay Render of 200 iterations taking 13 seconds. 32 mBlur iterations per step. pFlow iRay Render of 200 iterations taking 13 seconds. 64 mBlur iterations per step. pFlow iRay Render of 200 iterations taking 13 seconds. 128 mBlur iterations per step. 200 iterations iRay Render taking 12 seconds. 256 mBlur iterations per step.